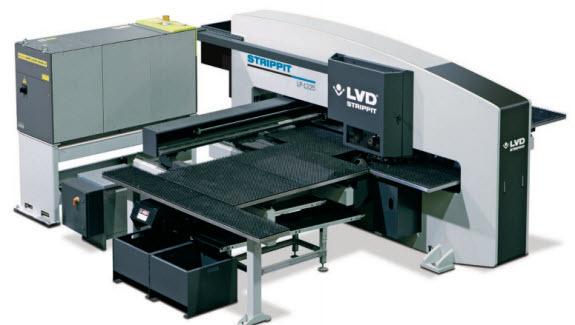 technology with the perfect balance of functionality and economy, combining field proven LVD – GE Fanuc laser technology and LVD Strippit punch press technology in a price sensitive integrated machine. GE Fanuc CO2 laser resonator generates up to 2500 Watts of cutting power to cut intricate shapes in metals and non-metals Complete integration of the GE Fanuc laser source, CNC control, AC digital motors and amplifiers offers a high degree of reliability and superior processing speed. GE Fanuc resonator is equipped with long-life discharge tubes, a cyclone cleaner unit, and photo catalytic elements to maximize resonator performance and longevity Laser power is matched to the axis speed to achieve a constant width of cut with a small heat-affected zone. 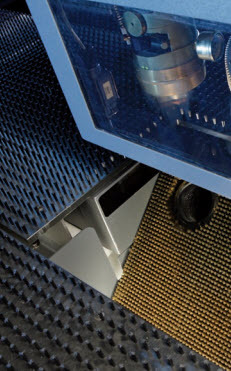 Large 11.8” x 17.7” (300 mm x 450 mm) programmable parts chute allows finished laser-cut parts to be directed through a drop door, eliminating the need to tab or micro-joint laser-cut parts for manual removal from a nested sheet. Stress relieved, single piece bridge frame and widespread axis bearing system provide rugged performance Precision servo controlled hydraulic system delivers high punching and forming rates Direct drive axis reliably maintaining accuracy of ± .004” (0,10 mm) with a repeatability of ± .002” (0,05 mm) over the entire table is consistently achieved. 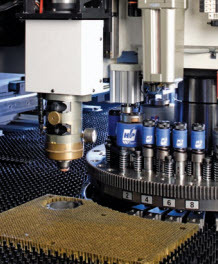 Compactly designed 33-station thick tool style turret lends large capacity Three 2” (50,8 mm) direct-drive auto index stations accept standard, tapping or wheel style tooling Quick change dies bases in the 1/2” (12,7 mm) and 1-1/4” (31,7 mm) stations reduce tool change time and increase uptime Smart Clamp™ feature automatically determines exact clamp locations to provide the smallest possible nopunch zone. This entry was posted on Monday, June 11th, 2012 at 10:05 am	and is filed under Punch Press, Uncategorized. You can follow any responses to this entry through the RSS 2.0 feed. You can skip to the end and leave a response. Pinging is currently not allowed.